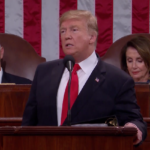 Many across the nation are reacting to the President’s State of the Union Address from Tuesday night. Some Troy University students and teachers were among the thousands who watched at homes and dorms. “I think President Trump did a wonderful job with talking about unity and unifying both the Democratic and Republican party to be affective instead of being an ineffective government,” Associate Professor of Public Administration Melissa Bailey says. Troy University’s Dean of Arts and Sciences Dr. Steven Taylor says a unified government would require give and take from both sides. But he has not seen either side willing to give. “So the speech in some ways in a continuation of the political fight we’ve seen between the President and the Democrats and the House,” Taylor says. There are several topics students say they will remember most from the Address, including job growth and possible troop withdrawals. “His relationship with North Korea, and how he’s kind of denuclearized the Korean Peninsula,” student Noah Channel says. Whether they were sitting in classrooms, walking down hallways, or lounging around campus, students have been discussing the speech. There has been agreements with Trump’s ideas, but there are also disagreements. Asked if Trump’s State of the Union Address could inspire both sides to come to an agreement, people say there is still a lot of work to be done. Students and teachers also say they will keep a watchful eye on Congress to see if an agreement can be made before next week to avod another government shutdown.